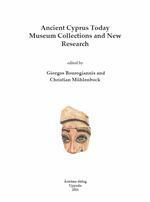 Astrom Editions AB - Ancient Cyprus Today. Museum Collections and New Research. Ancient Cyprus Today. Museum Collections and New Research. Redigerad av Giorgos Bourogiannis & Christian Mühlenbock. Uppsala 2016. 366 sidor.